I designed these socks for my DH for his birthday this year. He loves cables -- which this sock has in abundance. 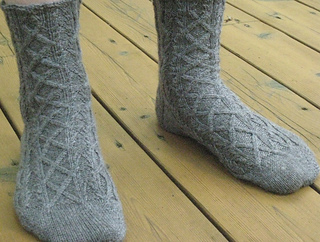 As with most cable socks, these socks are suitable for both male and female. The sock is worked from the toe up. 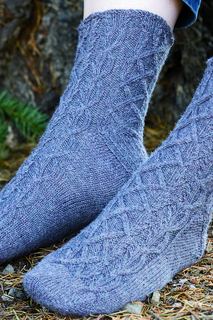 It has a rounded toe, a slip-stitch variation on Squeaky’s Widdershins heel, and a ribbed cuff (with cabling, of course). There is optional shaping for the leg . There are separate charts for each of 3 sizes (S, M, and L -- 7, 8, and 9” around).